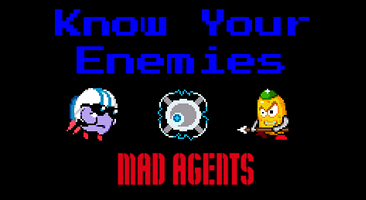 The Mad Agents enemies are challenging adversaries, using their various skills and weapons to prevent you from saving your IDA agent friends. The best way to defeat an enemy is to know their tactics. Read on, brave Agents, and save your comrades and the IDA from attack! These “block-heads” are low-level enemy agents. They may be dim-witted, but Rockos really know how to move when they have an enemy in their sights. Gunnar is a big guy with a big cannon. When he sets his sights on you, you better watch out for his fiery cannon ball. The Ninjump Crew is the name that this group of special agents have given themselves. They may look a little on the pudgy side, but don’t underestimate their speed and acrobatic abilities. Danger from above! FlyGuys are agents with jetpacks. These agents can move anywhere they please. There’s nowhere to hide from a FlyGuy. Dags are guard robots that constantly fly around looking for enemies. Without any real intelligence, Dags just fly in straight lines, only turning after they bump into a wall. The improved Dag 2.0 is a lot like its predecessor, Dag, except that Dag 2.0 has been upgraded with the ability to fly through some platforms. PewPews are robots designed to rain fire down on enemies. You better watch your head whenever there are PewPews around.